Hold onto your hats – and just about everything else, people – because the all-time outright Nurburgring lap record has just been obliterated. We reported almost a month ago that the 919 had been spotted at the Nurburgring as part of a photoshoot alongside the iconic 956 C, which, not-so-coincidentally, was the car Bellof completed his lap in. As it turns out, that wasn’t the only reason it was there. 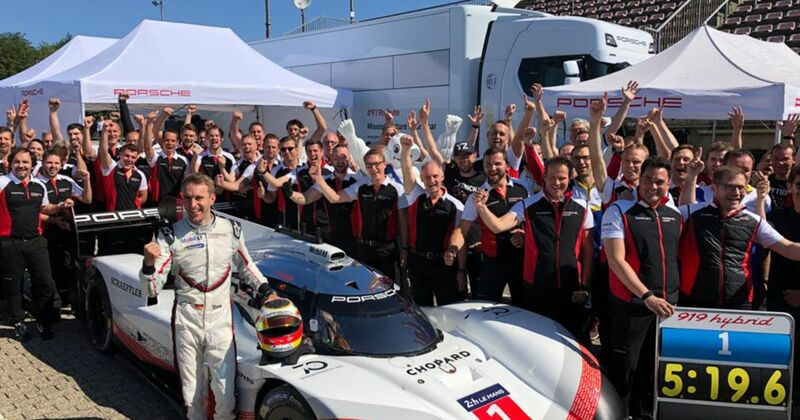 Exactly as we’d hoped, the 919 Evo went for the outright lap record. It didn’t just take it, though: it smashed it by 52 seconds. All we can do is sit, open-mouthed at the astonishing speed of that car. Freed from WEC regulations its new aerodynamics kit adds over 50 per cent more downforce, for corner speeds that should look insane on the on-board footage. About that, Porsche: please release the on-board footage immediately, so we can spend the next 72 hours watching it on repeat. EDIT: On-board footage now released and embedded above. Say goodbye to your weekends, everyone. Hat tip to Robert Gracie and AutoAddiction!